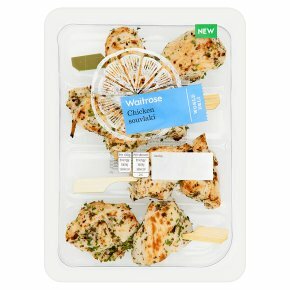 Skewered pieces of cooked and flame seared British chicken breast with a gremolata herb marinade, sprinkled with parsley. INGREDIENTS: Chicken, parsley, salt, olive oil, lemon juice, garlic, rapeseed oil, cornflour, lemon zest, coriander, rosemary, green chilli, black pepper, stabiliser (xanthan gum). WARNING: This product contains sharp bamboo skewers.